This brief case study is based on the use of OPERA, CESR’s monitoring framework, to develop a Visualizing Rights Factsheet on Egypt, which was prepared for the Committee on Economic, Social and Cultural Rights in 2013. It is part of a series of case studies produced by CESR to share insights and learning from the use of OPERA in a variety of contexts and settings. CESR uses short, visually engaging, factsheets as advocacy tools to help give a statistical snapshot illustrating the level of rights realization within specific contexts. Increasingly, we have modeled these factsheets on the four steps of OPERA. 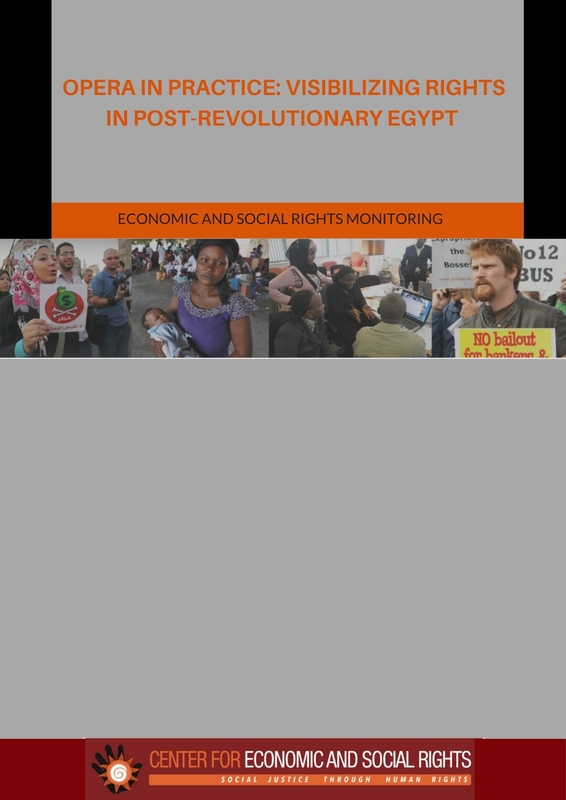 For this factsheet, we partnered with the Egyptian Center for Economic and Social Rights (ECESR) to show how economic, social, and cultural rights had fared in the wake of the country’s 2011 revolution. We used the factsheet in advocacy during Egypt’s appearance before the Committee on Economic, Social and Cultural Rights in 2013 and before the Human Rights Council’s Universal Periodic Review in 2014. The aim was to encourage these oversight bodies to issue strong recommendations to Egypt on the concerns documented in the factsheet. By covering an array of rights in the factsheet, we were able to give an overall picture of the scope and scale of socio-economic deprivation facing the country. Data analysis showed that large numbers of people in Egypt were not able to enjoy their social and economic rights. For instance, 18.9 million people were classified as at risk of poverty in 2013. The rate of children suffering from stunting (an indicator of chronic malnutrition) was estimated to be 31% in 2011, which is considered “high” by the WHO. Estimates of people living in informal settlements without facilities, amenities, and proper infrastructure ranged up to a quarter of the population. There were vast differences in how these deprivations were felt by different parts of the population. For example, certain regions saw poverty rates of under 20% in 2009, while others were in excess of 40%. Youth unemployment stood at 30% in 2011, three times the national rate. Rates of self-employment, which correlates strongly with informal labor, were increasing among all sectors but especially for women and youth.